Ships Monday, April 22 if ordered in the next 1 day, 16 hours and 2 minutes! Astaxanthin is an exceptionally powerful antioxidant that helps protect against the damaging effects of pollution, ultraviolet light, and immune stress. 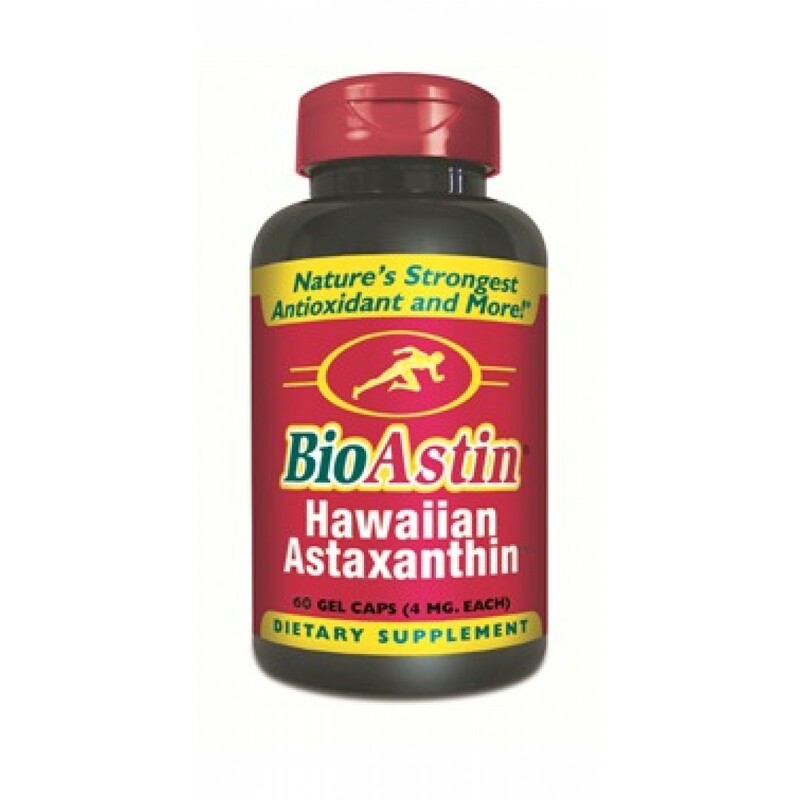 BioAstin® Natural Astaxanthin is the world's best selling brand of astaxanthin for humans. It is a dietary supplement with powerful antioxidant and anti-inflammatory benefits. Cyanotech produces BioAstin from microalgae in Hawaii. It was the first source of astaxanthin for human nutrition reviewed by the U.S. Food and Drug Administration (FDA). In August 1999, BioAstin completed a review by the FDA without objection and was allowed to be sold as a human dietary supplement. Research has also shown that natural astaxanthin has up to 550 times the antioxidant activity of vitamin E and 10 times the antioxidant activity of beta-carotene. Kailua-Kona, Hawaii (June 6, 2002) — Cyanotech Corporation (Nasdaq NMS: CYAN) has received a Notice of Allowance from the United States Patent and Trademark Office (USPTO) for its patent application entitled “Method for Retarding and Preventing Sunburn by UV Light”, based on the protective properties of astaxanthin. The patent covers the use of natural and synthetic astaxanthin as a single active ingredient to retard and prevent sunburn in both oral and topical applications. This is the third United States patent Cyanotech has received for the protective properties of astaxanthin. "Drug could spell end of tan creams"
"A pill to … end the misery of sunburn could be on sale this summer." "Tests on human guinea pigs have proved that the drug — called BioAstin — can reduce sunburn... Unlike creams it protects the whole body and does not come off in water." "News … was last night welcomed by British cancer charities." BioAstin was the subject of a clinical study conducted by Creighton University USA, School of Pharmacy, that compared the in-vitro oxygen free radical scavenging ability of BioAstin with other commercially available antioxidants. The study showed, and confirmed, that BioAstin natural astaxanthin was a significantly more potent antioxidant than vitamin C, vitamin E, beta-carotene, pycnogenol, grape seed extract. How much BioAstin should I take each day? Researchers recommend a daily intake of one capsule containing (4mgs.) four milligrams. For maximum effectiveness take BioAstin™ with meals, once per day. One capsule provides the equivalent strength of astaxanthin found in a one pound serving of salmon. BioAstin™ is a naturally occurring dietary compound, not a drug. There are no known side effects. Capsules are filled in a federally inspected nutraceutical facility. Source algae are cultured in controlled conditions in pure waters on the pristine Kona coast of Hawaii's Big Island. In addition the supplement is recognised as a food component in the EU diet. Check out the BioAstin Reviews page to see what people are saying about Bioastin. Dietary/Nutritional Supplements: The New Ally To Topical Formulations? The Daily Mail - Bioastin - Could this pill cure sunburn? So look no further, BioAstin contains the substance astaxanthin and is already being used by hundreds of regular customers and you could be one of them! Suggested Usage : As a dietary supplement, take 1 or 2 capsules daily with a meal. Serving Size 1 capsule - servings per container 60. Contains NO salt, NO yeast, NO sugar, NO corn, NO wheat and GMO free. I have just come to the end of my first bottle of 'Bio-Astin', deciding to use it to see if it's antioxidant contents would help with my Hay Fever. I've been taking just one a day at night. Last Thursday, my youngest son's teacher rang to say they'd been out doing games on the playing field and he'd got streaming, 'puffy' eyes and was sneezing his head off! When we'd taken both sons to school that morning, one poor parent was particularly suffering with this complaint. Now, I've suffered with Hay Fever for more years than I care to remember and apparently the grass pollen count that day was sky-high and had been for several days. I was completely unaware of this, I wasn't sneezing, had no sore, itchy or runnyeyes - zilch, de nada,nothing, nowt! I've used a fairly powerful natural antioxidant in the past but 'Bio-Astin' goes way beyond it! It really is brilliant stuff!